As most of you know, Presley has hair, lots of it. She was born with thick black of night hair, and over her last 16 months it has lightened dramatically and grown, and then grown again. Most of the time her curls are fabulous, the kind most of us covet. straight want curly, curly want straight, but to say the least the girls got great hair. It's also great for me because I have to only wet it and it's done. No blow dryer, no iron, no gel, no braids, no brushing. which leads me to my next photo, brushing. When i get Presley out of the tub, i put some conditioner in her hair to remove the tangles then i simply comb through it and leave it. Well, the other night Brandon and I wanted to see what it would look like if we combed it when it was dry. Well, the photo explains it all. And she still had curl, it would have been even bigger, but it bounces back pretty quick. 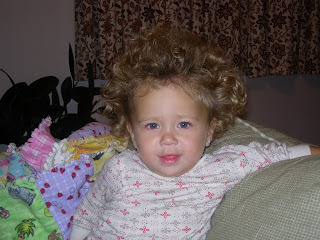 We love our little Presley, and we love her big hair. I also wanted to take a photo of all the kids together, which I have attempted many times, but have failed. three kids all photo ready anytime, on the count of cheese, nope just not happening. I took this photo, best one in a long time, only took me half hour to get it, but it's done, and now I can scratch walmart photo studio off my list, yeah for me. Yeah, I'm not all into the matching outfits and the special photo day, i like them simple, real, and in ordinary settings. and to me, that's priceless. Big, BIG hair! Cute pic of the kids. 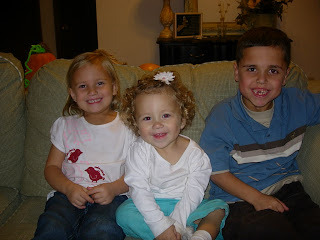 I know the frustrations of getting three kids to cooperate when you're trying to take a decent picture....argh! she looks so big! Not only because of the BIG hair. 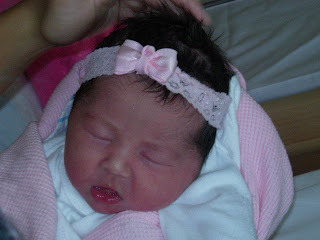 You should get a pic of her and Vivi with their BIG hair! So funny. Call me with your email. I was blog surfing and had to read a few posts on your blog to catch up and WOW! Such good news about Conner! I am so happy for your little family. I love love love Presley's big hair and am super jealous (can you really envy a one year old?). I WANT hair like that! What cute, adorable kids you have. You all looked so great at the halloween carnival. I'm glad it was fun---what a zoo it was.